Cool in the mornings and warm in the afternoons…that’s the forecast for the entire week and then it’s hot, hot, hot from here on out in lovely Austin, TX. With the cool mornings and buildings who keep their air conditioning at what feels like an arctic 32 degrees, I can tend to get in a fashion rut and grab that cardigan. There’s nothing wrong with that, but I like to try and mix things up. For today’s Outfit of the Day, I’m featuring the White Blazer. She’s been ignored in my closet and it’s time to pull her out and see the many ways I can wear it. I have a lunch date with a friend today, so this casual outfit is perfect. I’m obsessed with this blue nail polish right now. It’s L’Oreal’s Not a Cloud In Sight. My goal at some point this week is to change up my color. 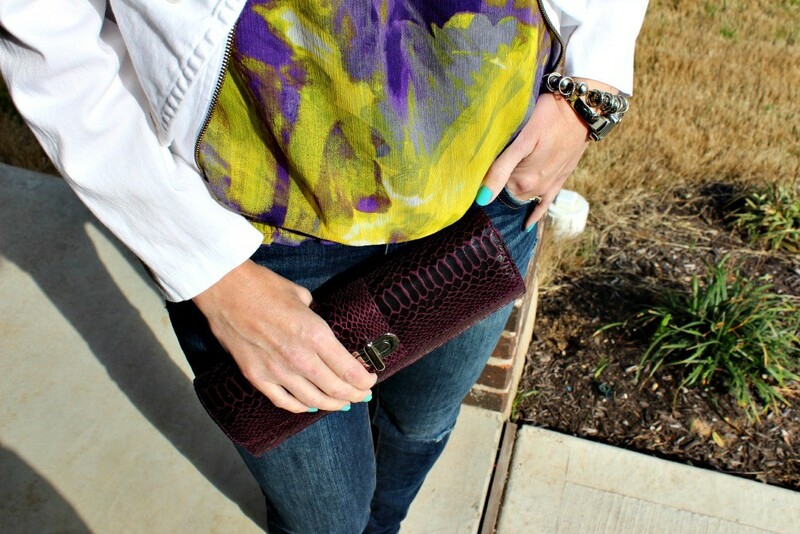 We’ll see… This purple clutch looks small, but it actually holds quite a bit. It’s perfect for my keys, wallet, lip gloss and sunglasses. I can also roll up the sleeves to give it another look. So many options! There are endless possibilities. You’ll see this blazer pop up again this week, so stay tuned for that! How would YOU wear a white blazer? Do you have one? Let me know! 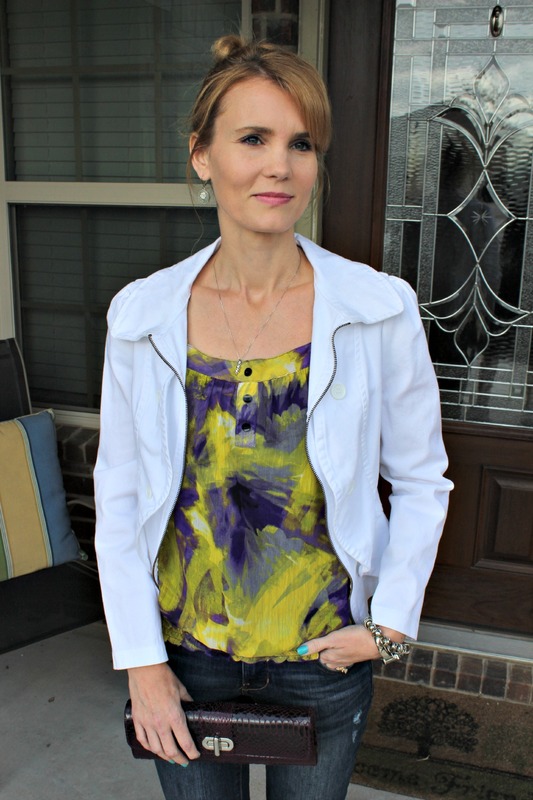 That blouse is a fun pop of color against the white. I just ordered a white jacket for spring.. can’t wait to get it. The pop of color under goes well also. 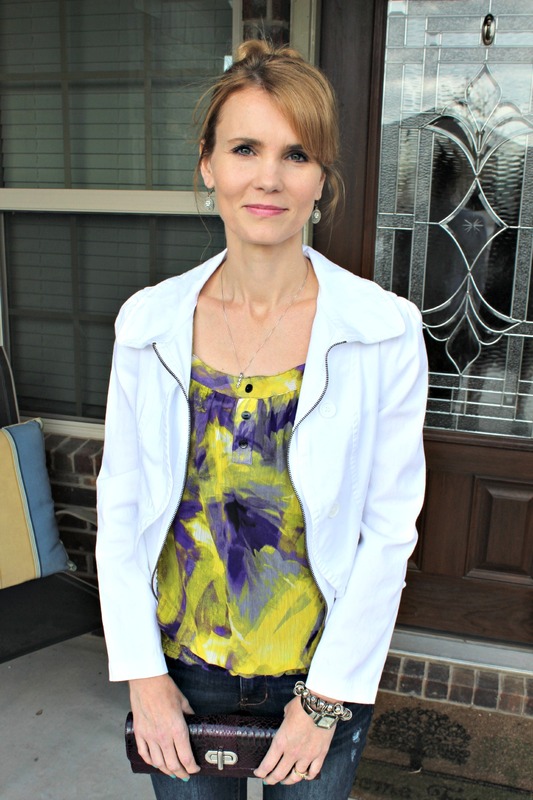 Thanks for linking up with Real Mom Style, you look fab. Thank you Andrea! I was having a conversation last night with some teen girls about all of the great finds from thrift stores. They thought I was nuts. The other day I found a $200 dress with the tag still on. I paid $10!! So many cute outfit ideas! I can’t wait for Spring! You look very pretty in the floral and the cute gladiator sandals. I love thrift stores as well…you never know when you will come across a jewel at a great price!